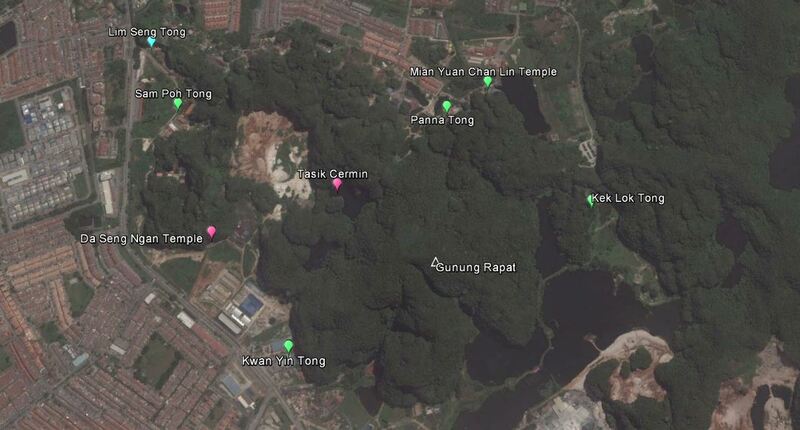 On our way to Taiping, we wanted to visit the Mirror Lake in Ipoh and try to find Japanese graves in Pokok Assam. 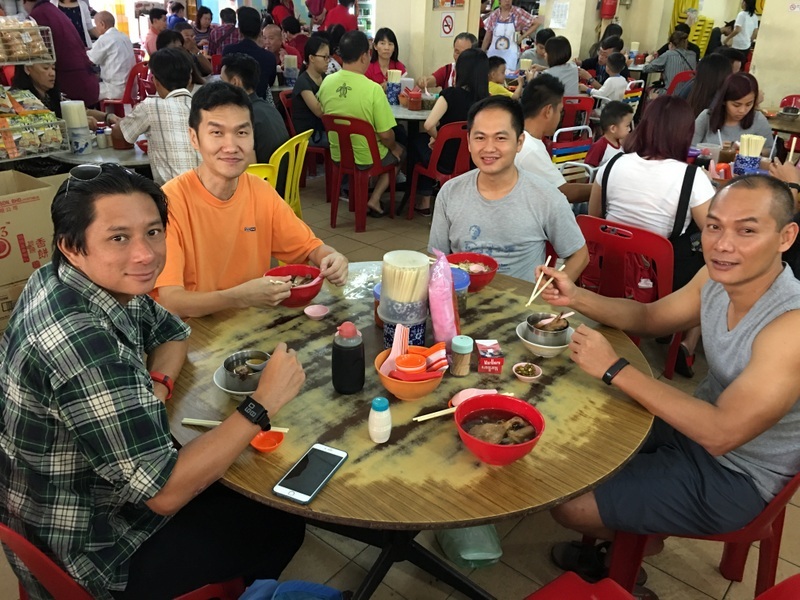 But the weather was not favorable, so we skipped it (see the end of this report), but still arrived rather late in Taiping, just in time to have assam laksa and cendol in the Old Railway Station. We had booked a room in the Furama hotel and had dinner in Siang Malam with our friend May. Before our dinner we still had time to walk around in the Lake Gardens, this time not only to enjoy the beauty of it, but also to start the project I had planned…:-). Notice the two bridges below, at the right. They show the same bridge, but one picture is from about one century ago. 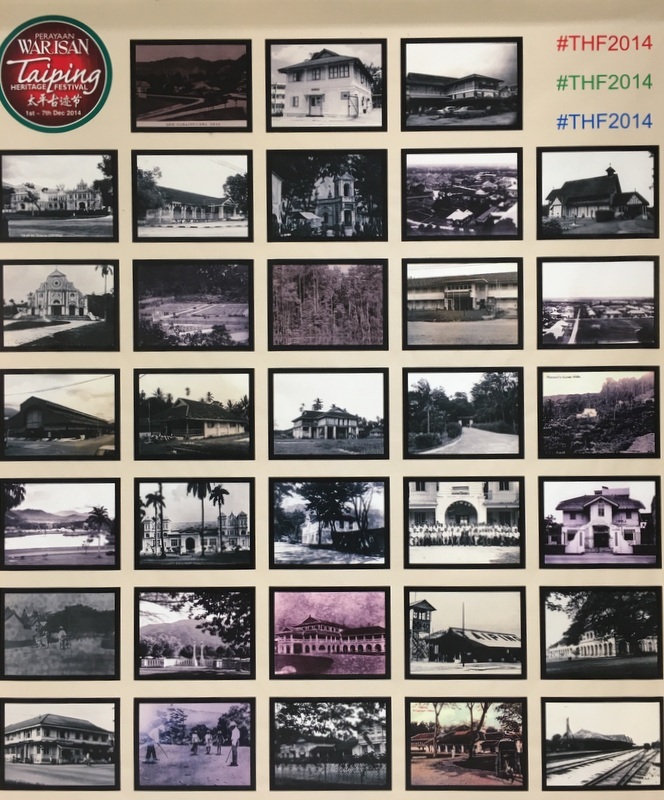 I had collected a number of old (postcard) pictures, and the next morning I met friends from the Taiping Heritage Society for a walk through the town, looking for the location from where the old pictures were taken, and then take a new one from that location. 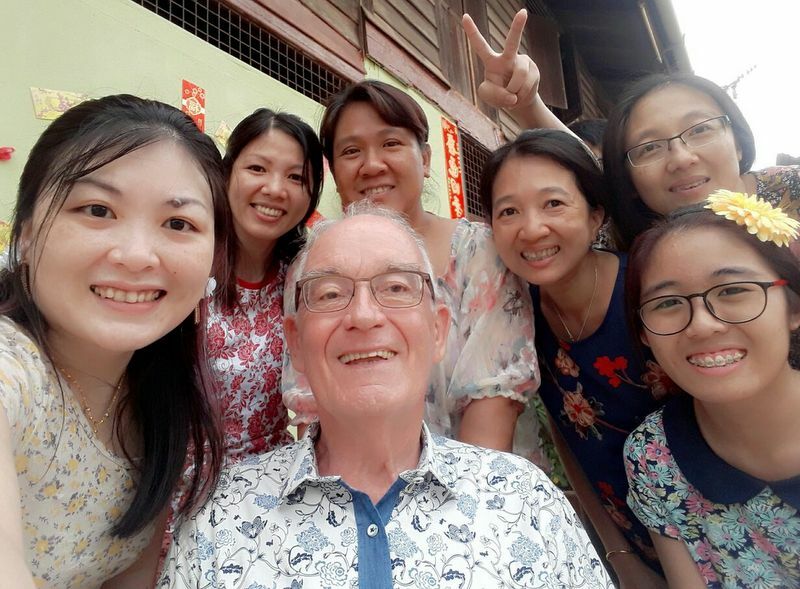 It was not always easy but big fun, the result can be found in a separate report, Taiping, old and new . In the afternoon we were invited by May for High Tea in her “Maywarmers Lodge”, where we met Suet and Peter, who are now residing in the Nest bungalow, a place I hope to visit soon. After that we met Paul and Fahmi, who had come to Taiping to visit a waterfall the next day. First we had dinner in Yut Sun, a Taiping landmark, famous for its Hainanese Chicken Chop. 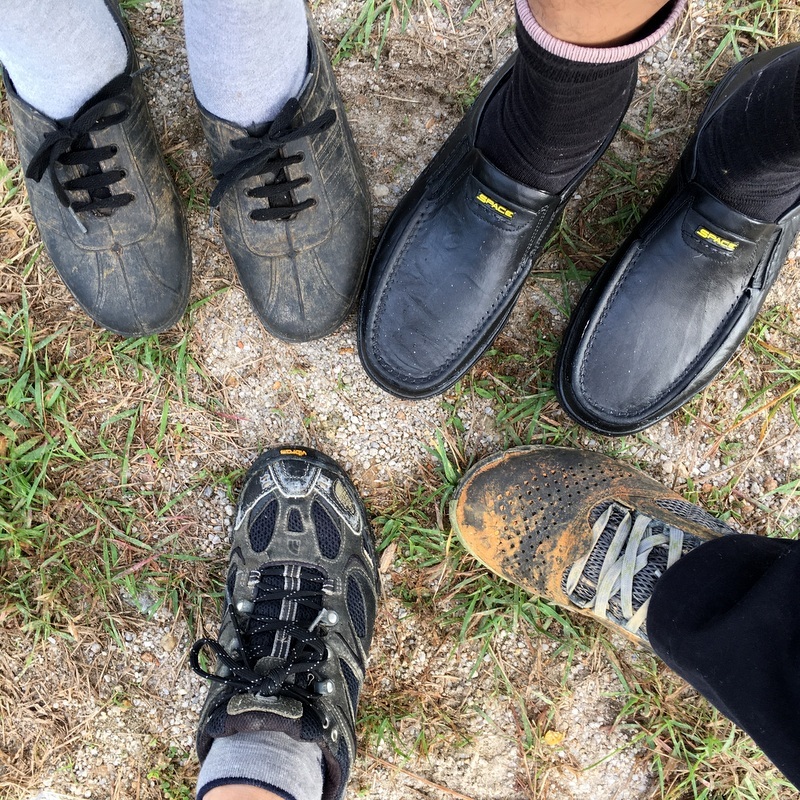 Then we walked to the Government Office, one of the many Taiping firsts. There was a pasar malam, many people , relaxed atmosphere. 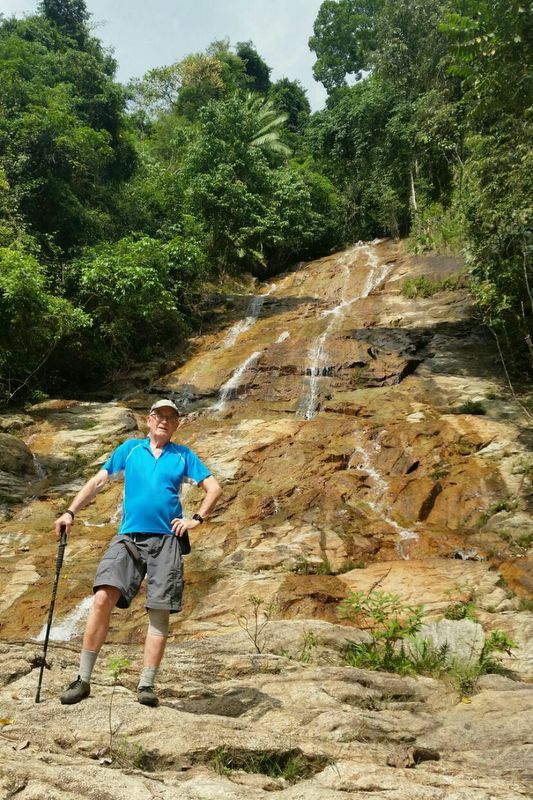 The next day, the four of us went on a waterfall hike to two Taiping falls, the Kamunting fall (left) and the Maxwell fall (right).The last part of the Kamunting hike is very steep, access to the Maxwell fall is easy. 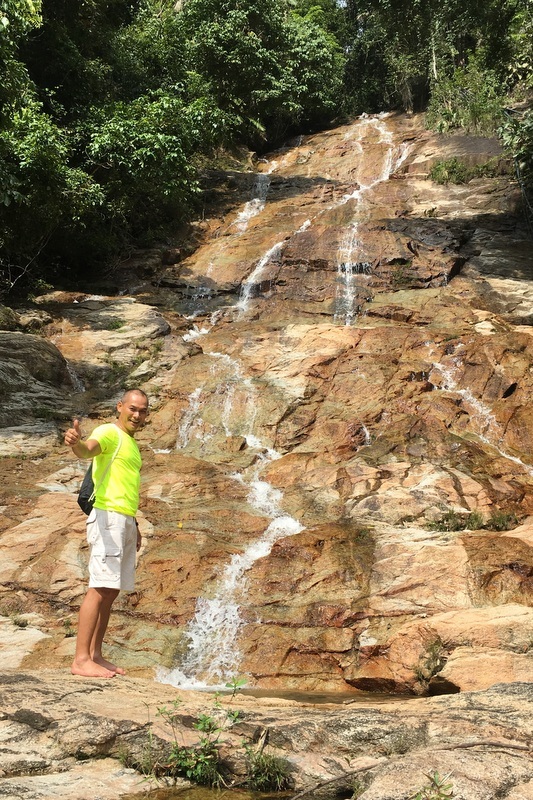 I wrote a separate report about this hike, Taiping Waterfalls. 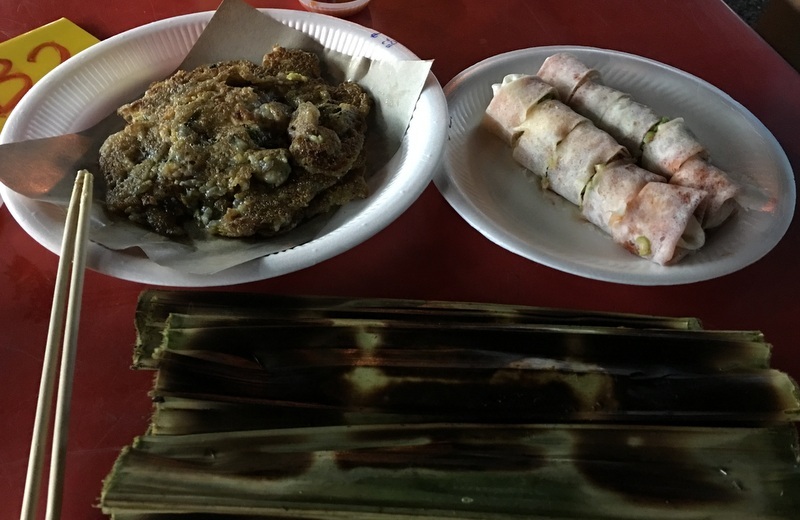 After the hike, Paul and Fahmi drove back to KL, we had a lazy afternoon, with dinner in Prima (popiah’s, otak otak and oyster omelet). After our dinner we visited the Taiping Mall, mainly because there are some panels with historical pictures of Taiping. The next morning, after breakfast we first went to Pokok Assam. My THS friend Amril had given a detailed description of the field were the tombstones were to be found. Landmark was a huge tree with a small Hindu temple. in one corner of the field. Exploring the field, we found a number of isolated tombstones. Some of them had engravings, which Aric could decipher as being Chinese. No Japanese tombstones. But one of my friends who lived in Pokok Assam as a teenager, told me that he had taken Japanese officials (?) to the graves. He thought that maybe the remains had been exhumed and taken back to Japan. Another THS friend thought the existing tombstones might have been erected for people who had died in the hospital without next of kin. It was an interesting excursion. On our way back home we still had time enough to visit Tasik Cermin, the “secret” Mirror Lake near Ipoh. I had been there before, Aric would like to have a look himself. The lake is located in an active quarry and can only be reached through a tunnel. 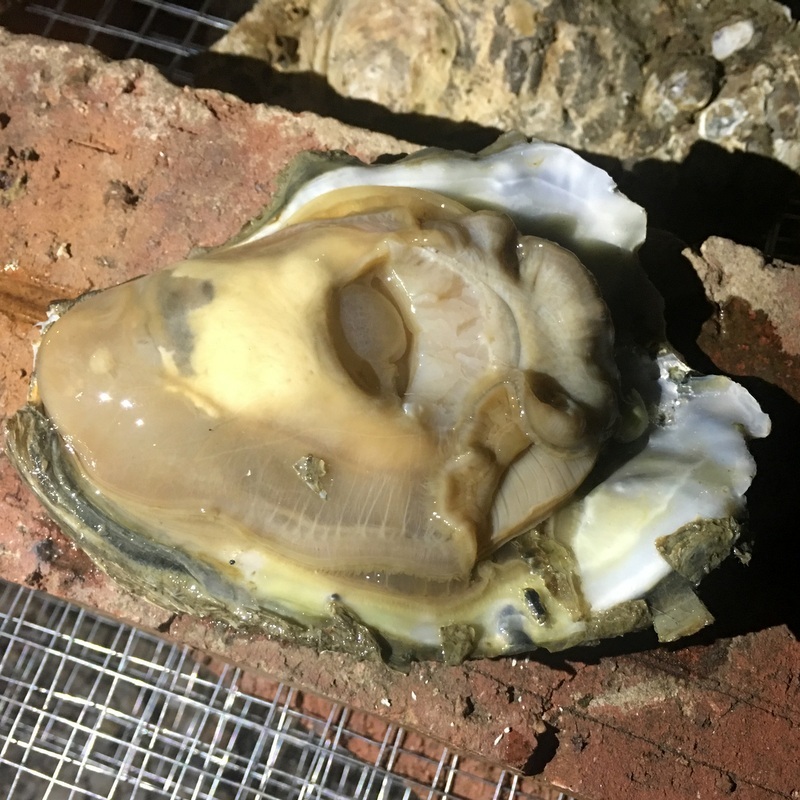 There was a warning sign at the entrance of the tunnel that access was not allowed because a few months earlier a piece of rock had fallen down and damaged the platform. We trespassed and had a (quick) look. The quarry is located only a few hundred meters from the trunk road no 1. Driving back we noticed a sign for a Chinese temple. There are several well known temples in this region, for example Kek Lok Tong and Sam Poh Tong, but this one was new for us. The name of this temple is Da Seng Ngan. The caretaker said it was actually an old temple, but long time covered by a landslide, and only rediscovered in 2006. More information can be found here . 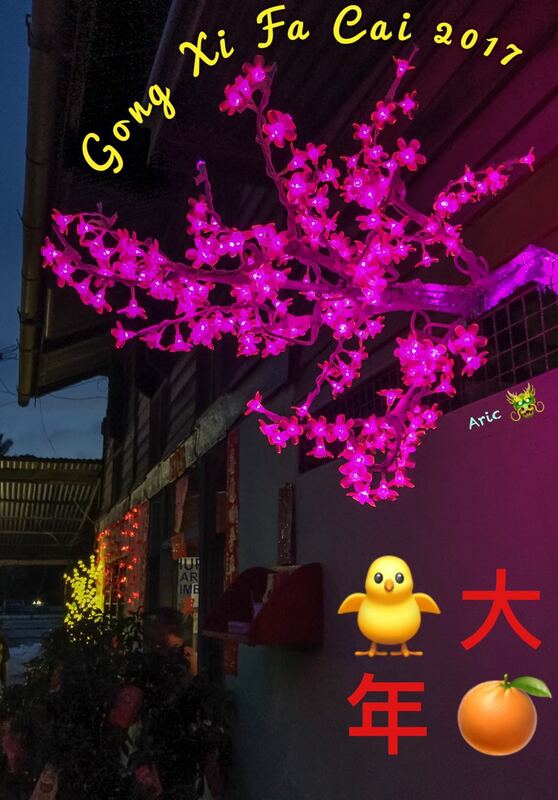 On 28 January 2017 the Year of the Rooster started. 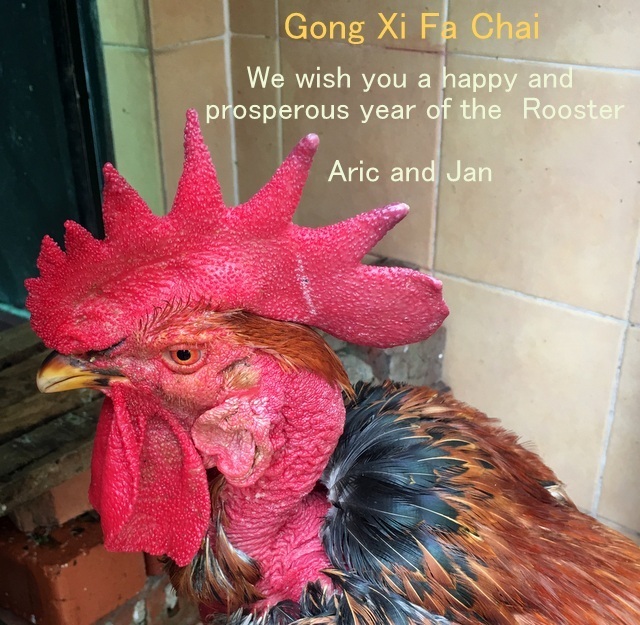 I had created a New Year card, using a picture of a magnificent rooster belonging to a friend of mine. The Chinese zodiac has 12 signs and 5 elements (water, fire, earth, wood and metal). This time it is the Year of the Fire Rooster. 2017 is a leap year, with 13 months, the sixth month will be repeated. 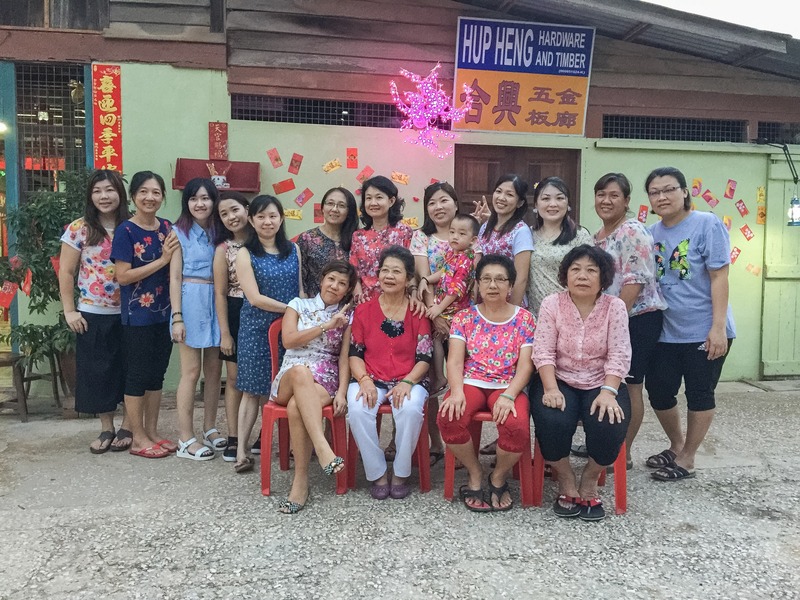 As usual Aric had gone back to his hometown Parit Baru a few days earlier, to organise the festivities for day 3 of the CNY. Each year there is a dress code, this time everybody had to wear a flowery shirt, else you had to pay a fine…:-). There would be a BBQ party, a lottery and a competition for the most original/beautiful shirt. When I arrived on day 3 late in the afternoon, the preparations were already in full swing. 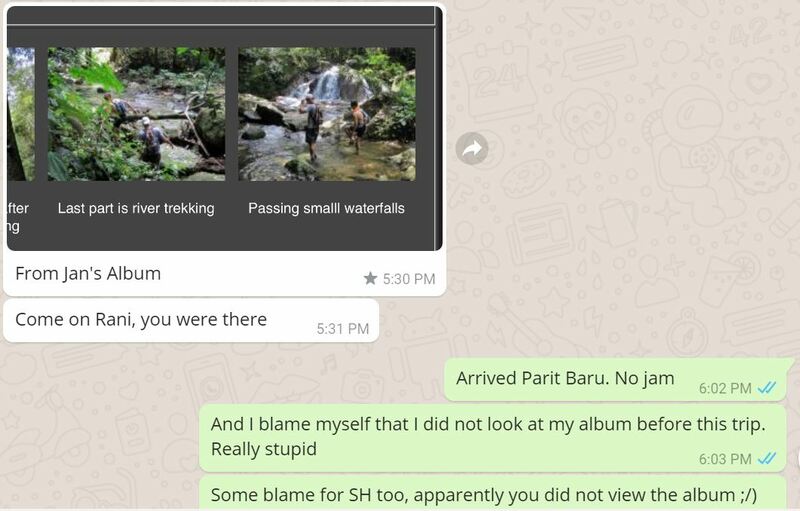 It is a tradition that I visit a waterfall with my friends on day 3, but this time we failed to reach the planned waterfall after a long hike. 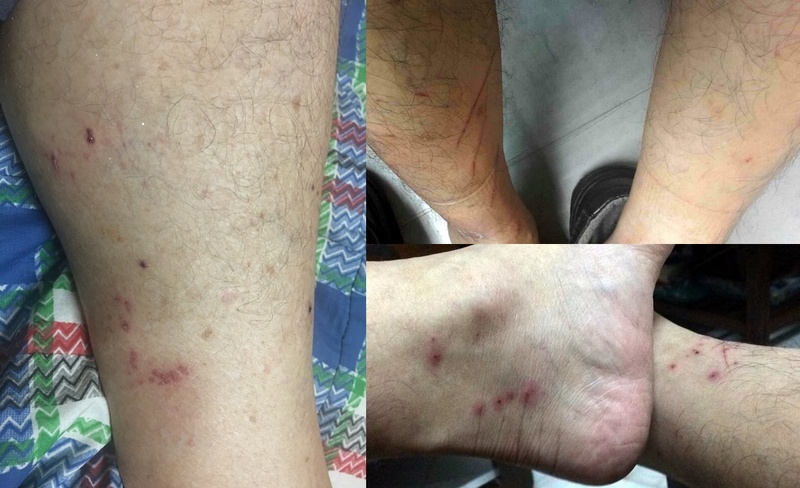 Here is my report: An unsuccessful waterfall trip. So I was rather exhausted when I reached the family house. But in this picture I still look quite fresh with my new shirt and surrounded by flower girls..:-). 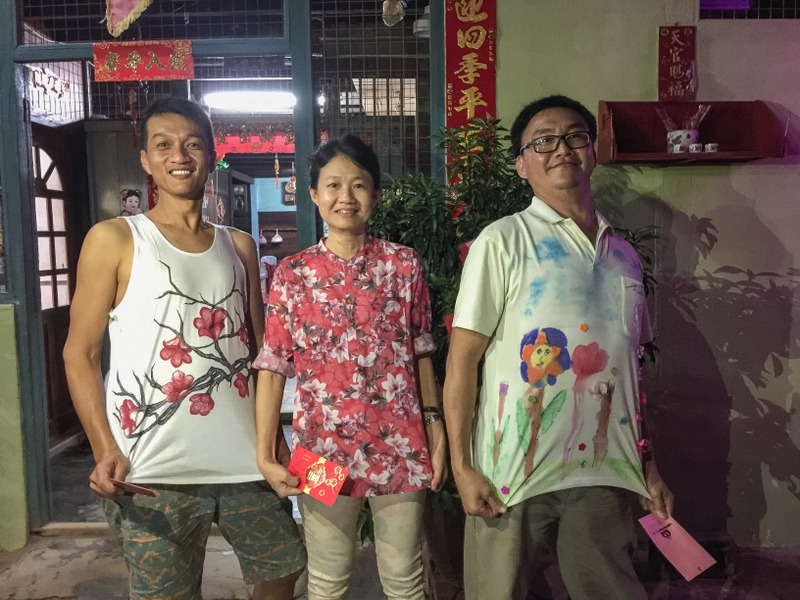 Aric had bought my flower shirt, told one of his cousins about it, who liked it so much that she bought an identical shirt for her husband…:-). In the kampung house in Parit Baru three families have been living together, Aric’s late father and two of his uncles. That explains that there is such a crowd during CNY, when all the children and the (many!) grandchildren are coming back to their hometown. Before it gets dark, group pictures had to be taken. 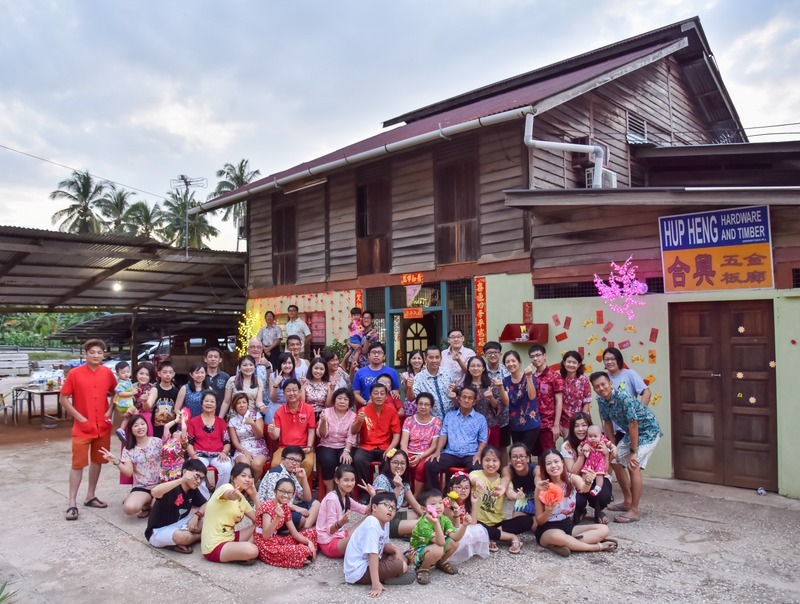 Here is a picture with everybody in front of the kampung house. 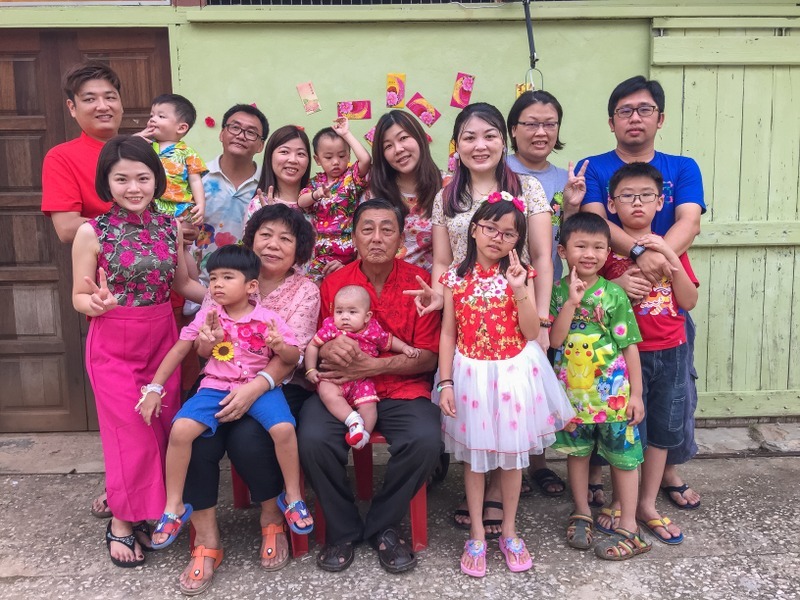 Two more group photos, one with all the ladies, and one with Uncle no 5 and his family. Then it was time for food, lots of food. For example 500 sticks of satay…. 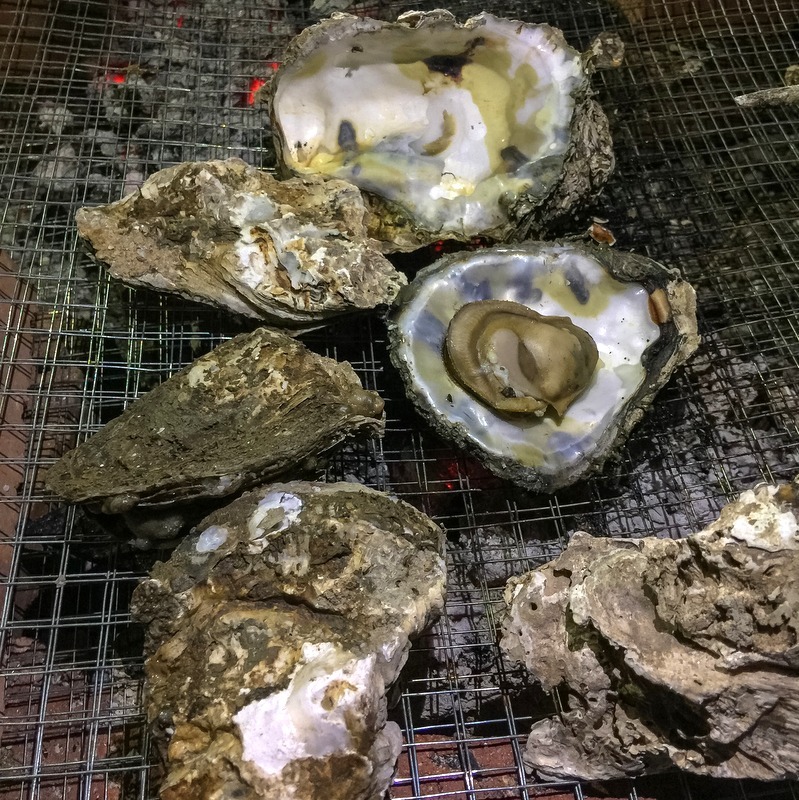 :-) And there were oysters! Huge size, most people liked them barbecued, I preferred them raw. Delicious. The last activity was a lottery. Ang pow envelopes were attached to the wall of the house in two sections, one for the kids and one for the adults. Everybody had to pick an envelope, and three envelopes contained a piece of paper with a number written on it. I am never lucky with this kind of games, but this time I had a paper with a 2, meaning the second prize! 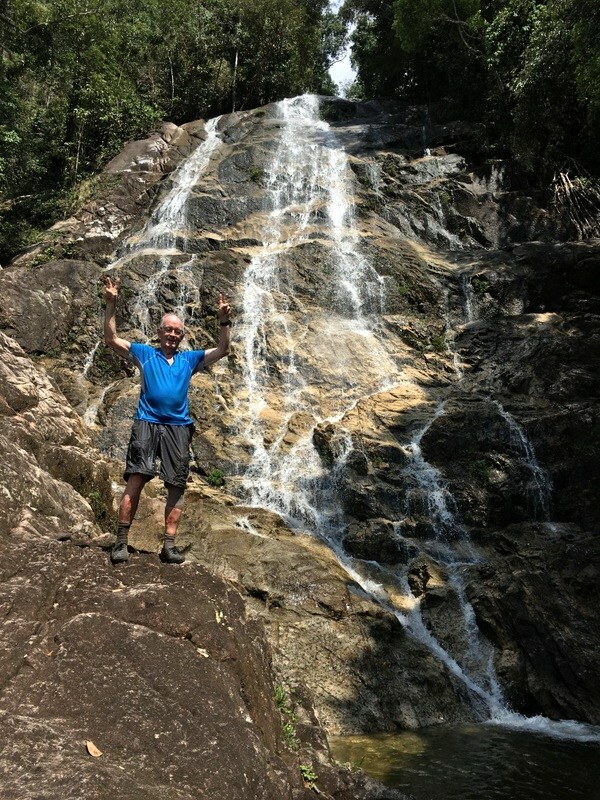 It has become a tradition that a few of my waterfall friends and I make a trip to a new/unknown waterfall on day 3 of the CNY. We have visited Lata Naga Air (2012), Ulu Lecin (2013), Upper Damak (2014) and Lata Enggang (2015). Last year we were not successful. 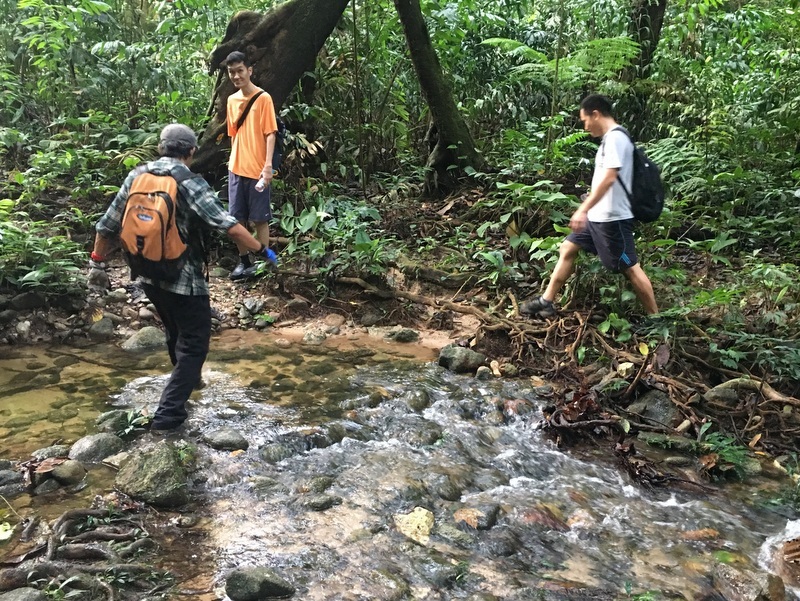 Our target was a waterfall in the Beruas region, discovered by Siang Hui. But when we arrived at the trail head, we were stopped by a soldier. A military exercise was going on and access was prohibited. Pity. We could have tried the same fall again this year, but the soldier was vague about how long the exercise would last, possible a long time. We didn’t want to take the risk. 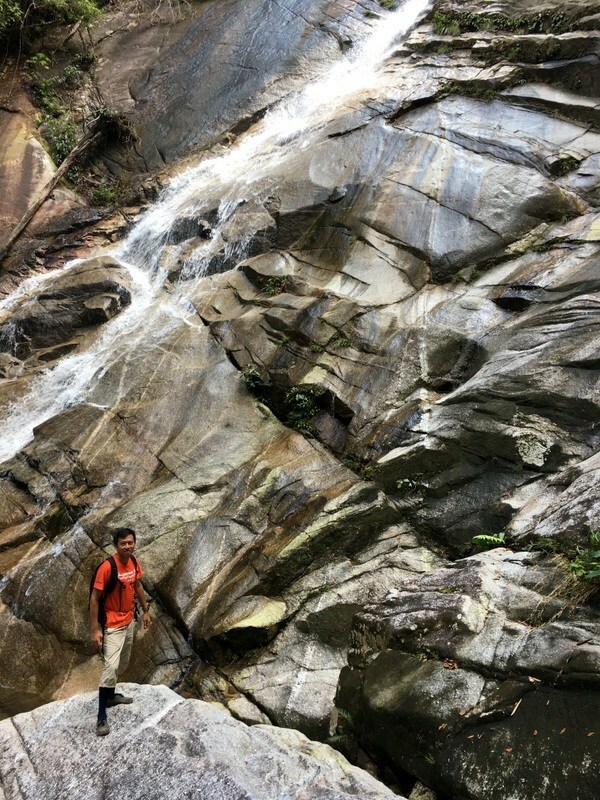 Instead Siang Hui suggested Lata Jala in the Bidor region, a waterfall he had discovered on Google Earth but never yet visited himself. Lata Jala, I said, I have never heard about that fall. But you have visited this fall already, he replied, and even reported about it! A hike of 20 km, taking 9.5 hour? Forget about it, I could not do that anymore, was my reaction. But there is a shorter access route, Siang Hui said. And not only was he right again, I had actually used that route during a second trip, August 2010, this time with Rani and Richard. Here is a GE screenshot of our first hike, starting at the Gepai waterfall. Click to enlarge for details. 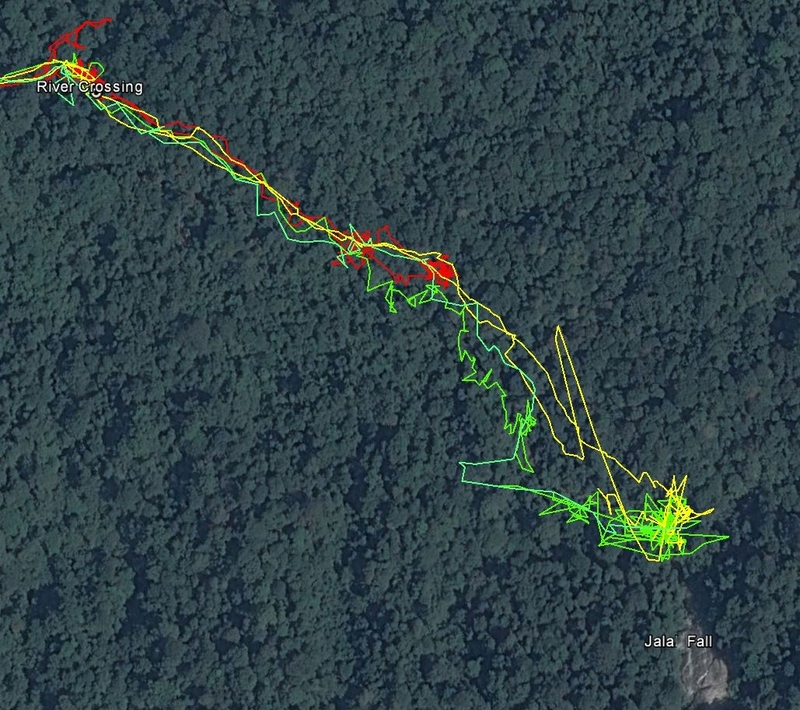 A long hike as you can see… 🙂 But notice the red line. On our way back we took a wrong trail, which probably would have lead us to Kg Senta. Could that be a shorter approach? Here is our second hike in August (yellow line). It was possible, using a 4WD to follow a farm road until the end and park near a farm. We lost more than one hour by taking a wrong trail, but taking that into account, a hike to Lata Jala would take about 4-5 hours. That seemed doable at my age..:-). So we decided to go. But as it was rainy season, we should better start early. 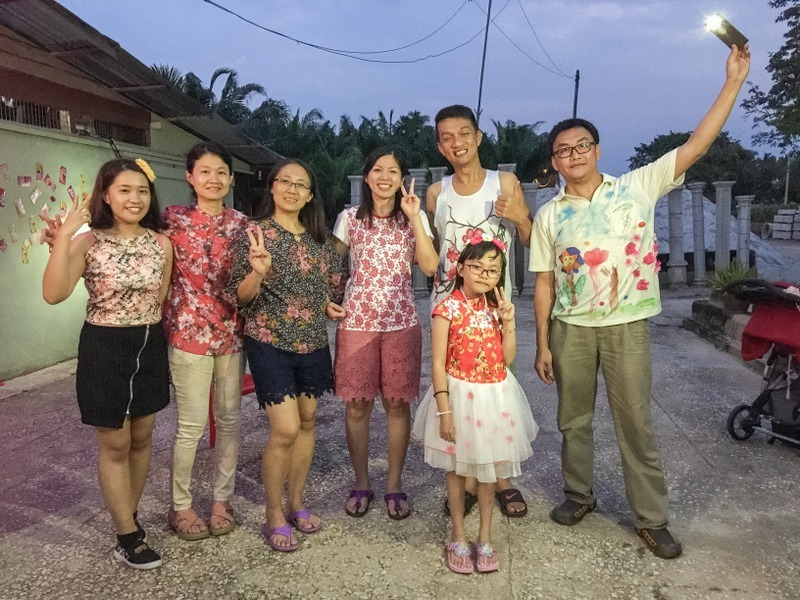 Also I was expected the same evening in Parit Baru, for the CNY party of Aric and his family. 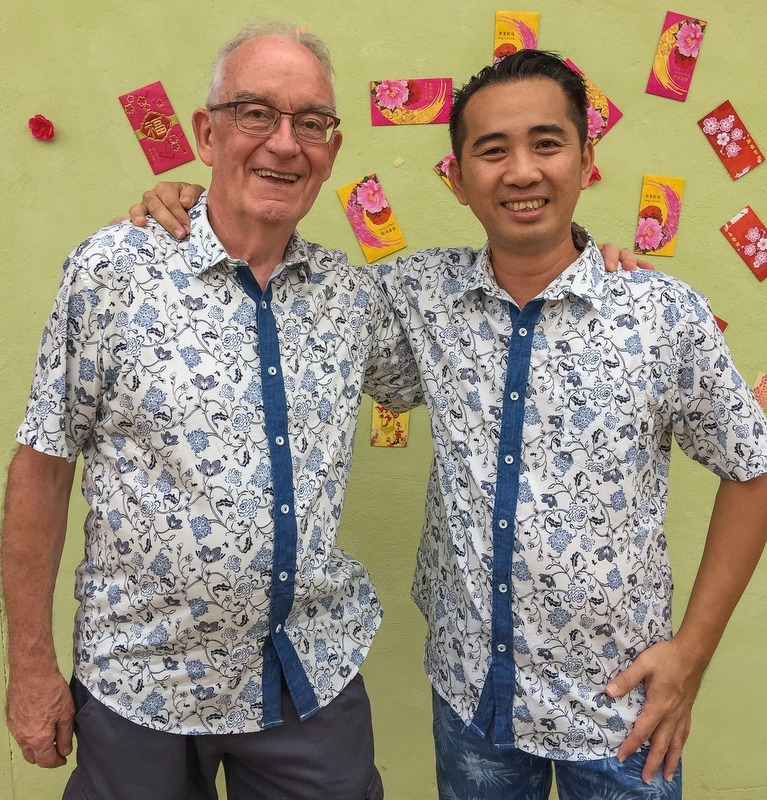 Siang Hui and Nick were already in Teluk Intan, celebrating CNY. Teoh was coming back from Penang, Rani and I started from the Klang Valley. 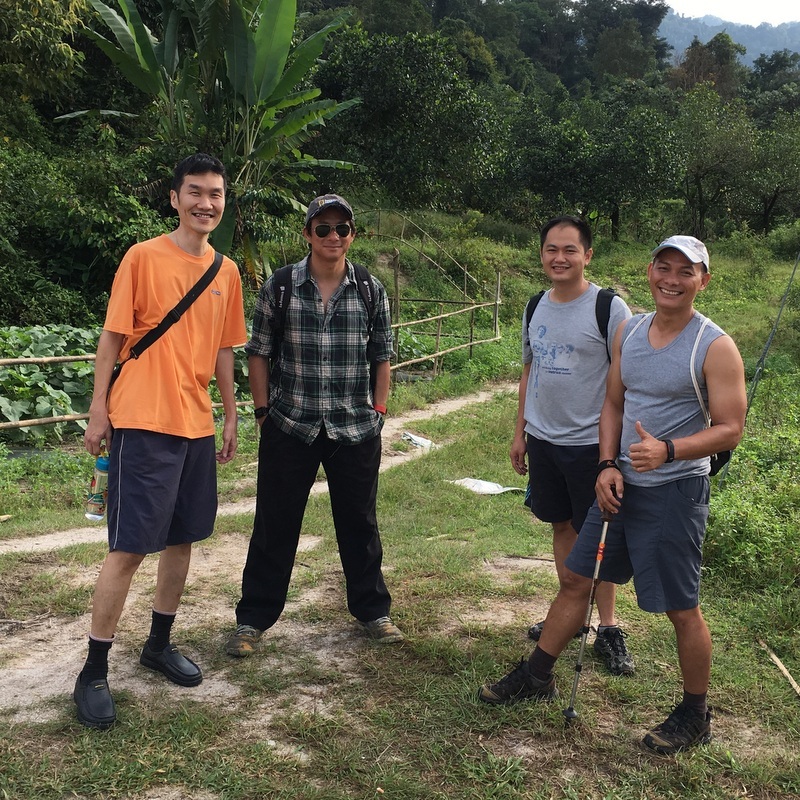 The three of us decided to stay overnight in a Bidor hotel, meet Siang Hui and Nick for breakfast at 7:30 am, after that start the hike. Discussing preparations for the hike, Rani asked me, do you remember any river trekking? In that case I will use my kampung Adidas. I don’t think there was any river trekking, I replied him. And he agreed. On the 2nd day of CNY Rani and I met in Bidor for lunch and we checked in, the hotel was booked by Teoh who would arrive later. How to spend the afternoon? 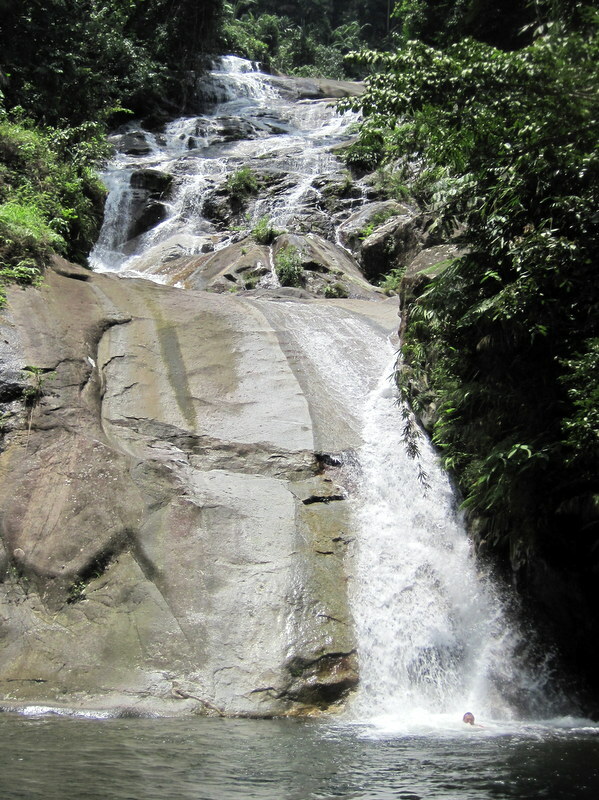 Siang Hui suggested the Seri Kampar Fall, not far from Bidor and an easy five-minute walk from the main road. He can sometimes be a bit optimistic in his time estimate, but this time he was right…:-) First a country road, then a clear trail, a bit of scrambling at the end. The fall, more a cascade, did not have a lot of water, but interesting to find it so near to the main road. We could not stay long, because it started to rain. 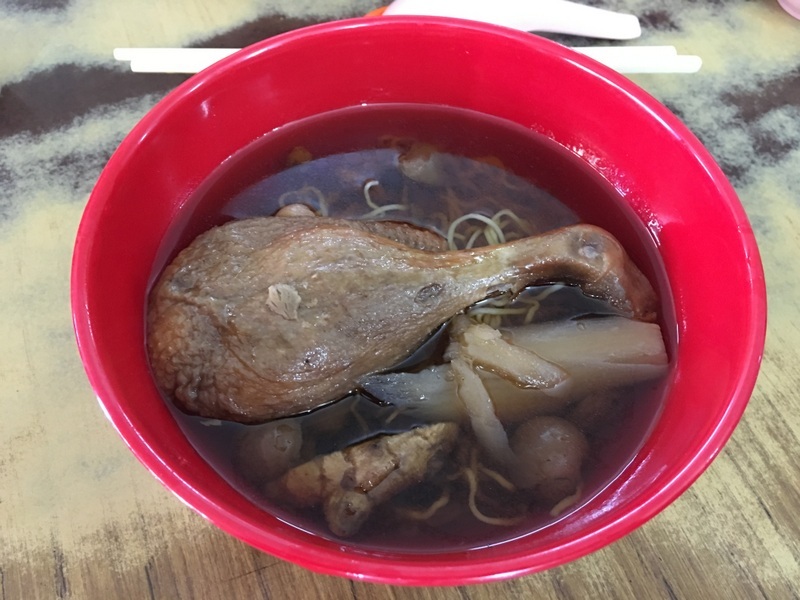 The next morning we had breakfast in restaurant Pun Chun, famous for its duck noodles. It was crowded, we were lucky to find a free table when we arrived. From Bidor it is only 10 km to the trail head. The last part is a farm road, Teoh’s 4WD came in handy. We started at 9:15 am. Nick had forgotten to pack his old kampung Adidas, but had managed to buy a brand new pair. Gentlemen shoes..:-) Also note the diiference in size. 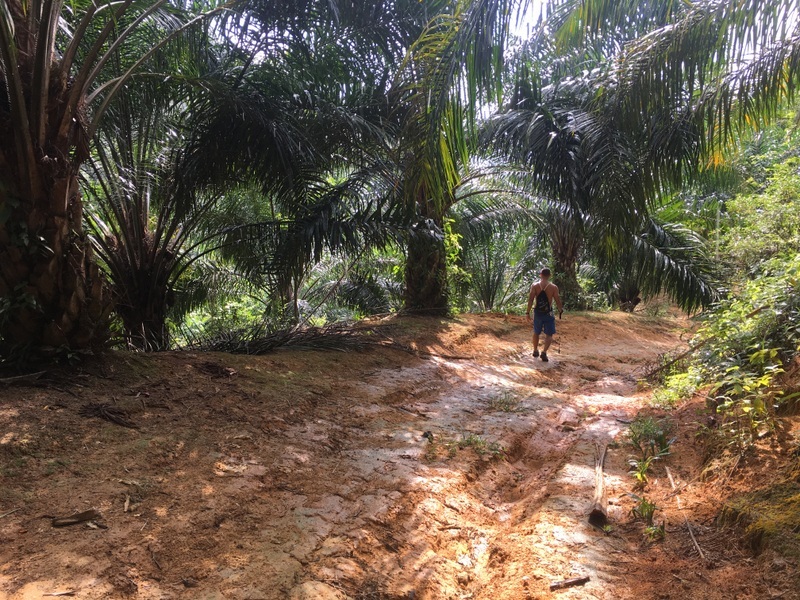 The first part of the trail is clear and in use by the Orang Asli. 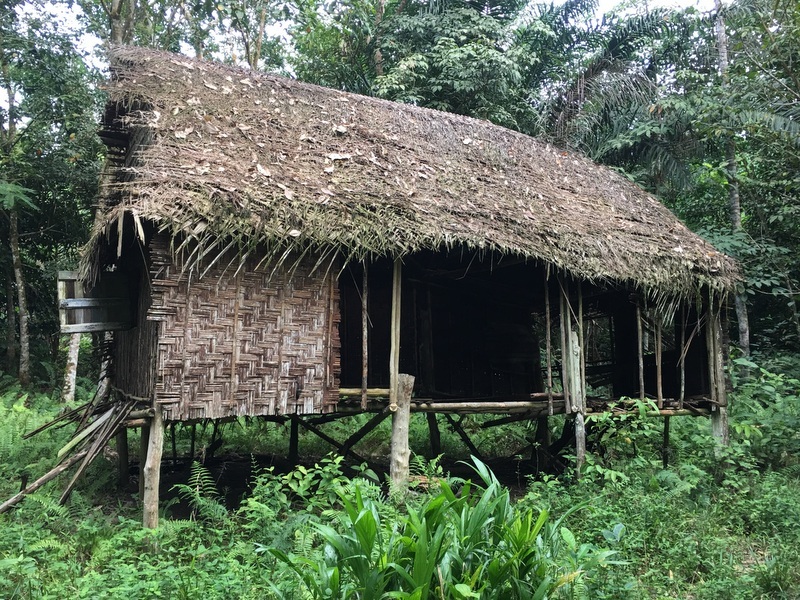 We crossed a small stream and passed an abandoned Orang Asli house. Progress was fast and in about one hour we reached the junction with the trail coming from Gepai. In good spirits we continued, the trail became smaller but was still clear, here and there we needed a parang. Here is the GE map of our trek, in red. As you see, the red trek doesn’t reach the Jala fall! We encountered a minor problem when we reached the river crossing. I had forgotten to mark this crossing on my GPS and neither Rani nor I could remember whether we had to cross the (Gepai) river or not. So we tried first to find a trail at this side of the river, wasted some time and finally discovered that we had to cross the river, where we found the continuation of the trail. A few hundred meter further the trail reached the tributary Sungai Latajala with the waterfall not more than 500 meter away. And there the reasonably clear trail suddenly stopped. In retrospect of course we should have concluded that from there we had to river trek. But (see above) Rani and I did not remember any river trekking. 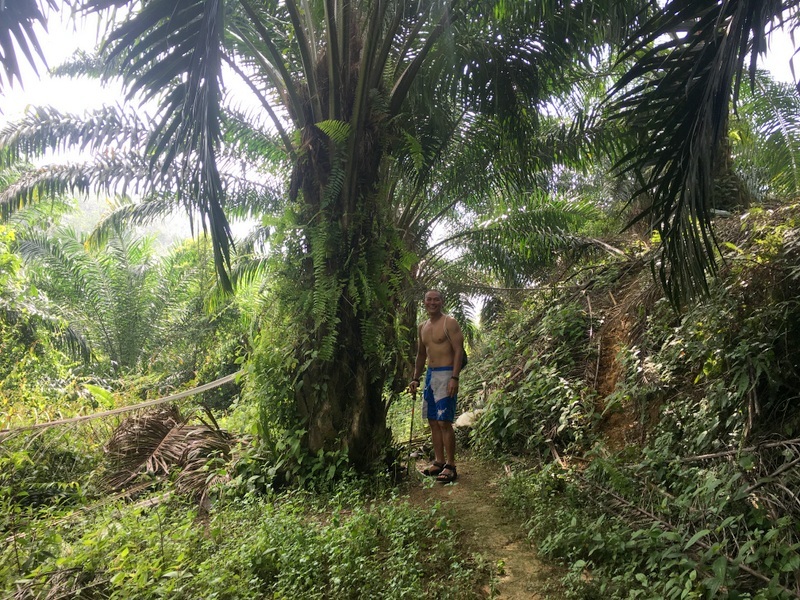 So, while we waited, Siang Hui and Rani tried to find a way along the slopes of the river, trying both sides, chopping a lot, scrambling up and down. It took more than one hour to come to the conclusion that the only reasonable approach would be river trekking. Here is a more detailed GE map of the last part. For those not familiar with the workings of a GPS, when you stay at the same spot for some time, the GPS readings will scatter around your location. And when you are in a valley with steep slopes, the readings can be erratic, as can be clearly seen in the last sections of the green and yellow treks. In the meantime it was already 1 pm, we had been hiking for more then 3.5 hours. Basically time enough and the weather was good, but I had promised to be in Parit Baru end of the afternoon. So, reluctantly we decided to go back. At 3 pm we were back at the car. After collecting my stuff in the hotel and a quick shower, I drove to Parit Baru where I arrived in time, around 6 pm. Of course I was eager to check my 2010 report, but no need, while still on may way, Siang Hui already sent this whatsapp. The last part was tough, river trekking, slippery boulders. Even now I do not understand why I completely forgot about that. Here are the next few whatsapp exchanges. We are seriously considering to go again, and maybe camp one night, so we have more time to explore.